Jake: Do you think I'll be happy? Honestly? Davis:"Oh, you'll be happy. You just won't know it. Growing up in the 80s, I had an intimate relationship with director John Hughes. I mean, we are talking about the guy who brought us such definitive era classics as Pretty In Pink, Sixteen Candles, The Breakfast Club, Weird Science, and Ferris Bueller's Day Off. Fortunately, I never took the fashion advice in these films to heart (well, except for the whole bra-on-the-head thing in Weird Science, but that's another story....). For better or for worse, these films spoke to a generation, although what exactly they said to us is debatable. Interestingly enough, as we grew older, so too did Hughes' films. He began dabbling in comedies that tackled slightly more "adult" subjects, especially parenting, which became an underlying theme in many of his writing, producing, and directorial efforts (Uncle Buck, Curly Sue, Home Alone, etc.). 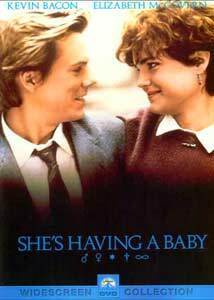 The genesis of this 'parenthood' phase began in 1988 with She's Having A Baby, Hughes' attempt at making fun of the young couple tackling their first child. Jake and Kristy (Kevin Bacon and Elizabeth McGovern, respectively) are a happy couple who sort of bumble into marriage rather quickly. Neither one of them seems to fully realize what a marriage will mean for their relationship, and they seem ill-prepared for the whole process. Regardless, they start setting up their American dream and before long Kristy starts talking about having a child, a prospect that Jake is not excited about. Their relationship is strained by the fact that they can't seem to settle on how to start a family (or when), and things are made more complex by Jake's friend Davis (Alec Baldwin). Davis, a long time friend of Jake's, seems to continually plant the seed of discontent, always questioning the couple's motives and making Jake feel like he's making the wrong decisions. While eventually things work themselves out, the comedic element here is represented by the exaggerated way in which everything is told. A lot of satire and surreal interjections are placed into the film. The inner thoughts, hallucinations, and self-realizations of the characters are often played out for real on the screen. Is it funny? To a degree, yes. The underlying question here, though, is SHOULD this be funny? While romantic comedies are constantly created, the whole "cuteness" factor of making fun of problematic relationships eventually wears thin. In She's Having A Baby, the entire core of the story is based around a couple that, for all intents and purposes, should NOT be reproducing. Now, of course, all relationships have difficulties at certain points, marriage included. The couple in this film, however, don't seem genuinely in love or particularly interested in anything other than basic, shallow, so-called family values—owning a large house, the perfect car, the perfect job, etc.—completely ignoring core values like whether or not you have sound peace-of-mind in your life situation. Kristy's character is self-absorbed and refuses to mete out even the most basic human affections unless Jake agrees to have a child and agrees to do almost everything her way. By the same token, Jake completely ignores his inner voices that try to figure out whether or not he's doing something he's comfortable with. Now, yes, people do sometimes get involved in situations (especially in loving couples) where they're taken by surprise; but this couple doesn't know where they're headed. Getting married and having kids is expected of them, so they do it. Not exactly the most inspiring of parents. Neither of them can answer the most fundamental questions about their own lives, yet they feel compelled to stay together for unclear reasons. In the end, the film is ultimately dated. It's a comedy that, though funny at certain points, thinks it's all-too-acceptable for people to have miserable relationships. I could have laughed more had this been the story of a couple who were simply dating, but as people thinking of bringing children into the world, their lack of ability is quite frightening. Image Transfer Review: The anamorphic presentation here looks nice overall and has good color balance. Unfortunately, there's a bit more compression artifacts and grain than normal, resulting in an image that has a lot of movement. It varies from scene to scene, but in general the transfer has a hazy feel to it that never really seems to go away. Fans of the movie won't be driven away, but it could have looked better. Audio Transfer Review: The Dolby 5.1 sound mix is a nice upgrade to the film. It adds a nice clarity and depth to the audio, though there isn't a whole lot of specific directionality. The surrounds do get used, though, for ambient sound effects and other supporting features. The front channels are well balanced and dialogue mixes in perfectly with the rest of the mix. Dolby 2.0 Surround audio is available in English and French. To be honest, there isn't a whole lot of difference between the 2.0 and 5.1, but in general the 5.1 sounds cleaner and the split surround effects sound better than the mono surround of the 2.0. Extras Review: Other than a trailer, nothing else is featured. The presentation is a bit bland, though there are English subtitles. I suppose a few extras of some sort would have been nice for John Hughes fans. I have heard unconfirmed reports, though, that Paramount is having some kind of legal trouble with providing extra features for Hughes' films. Either way, the disc is pretty bare bones. She's Having A Baby is a fairly bland comedy about fairly bland people. Perhaps the bare-bones presentation is appropriate? Try a rental.